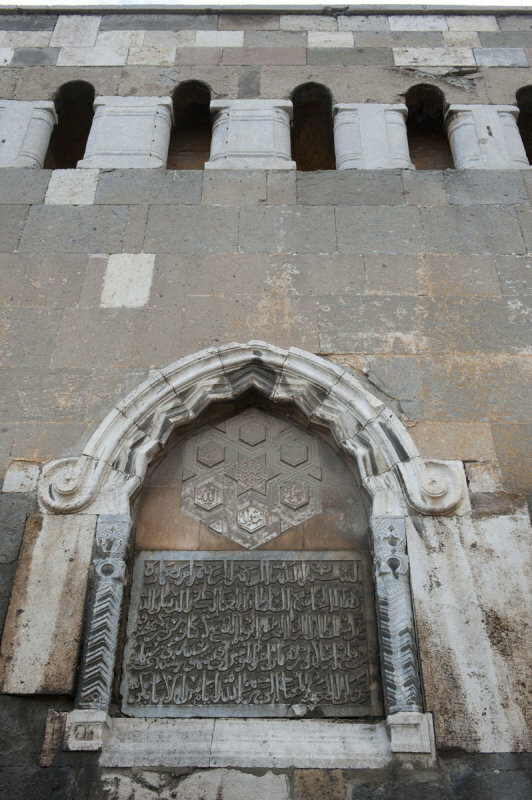 One of the building inscriptions, inserted in the northeastern (main) facade of the Alâattin Camii. Seljuk, 12th or early 13th century. The short pillars in the upper part of the wall are so-called ‘spolia’ (reused elements of ancient monuments); this pillar type was common in Early Byzantine religious architecture of the 5th-6th century AD. Sources: ‘Türkye Tarihi Yerler Kılavuzu’ – M.Orhan Bayrak, Inkılâp Kitabevi, Istanbul, 1994. & ‘Karaman (Tarihi ve Kültürü)’ (Ilhan Temizsoy & M. Vehbi Uysal) – Konya 1981.